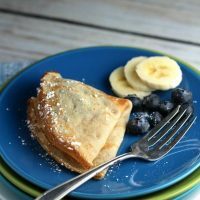 Pancakes from Around the World is the theme today that prompted so many of my fellow #Breadbakers to share recipes today. Some share family recipes that result from years of tradition while others reached out to try something new. 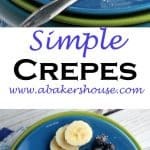 I took this chance to try what likely is a standard recipe for many home cooks but is one that I had never tried at home: crepes. Ah, yes, crepes, the French have a way of elevating simple recipes such that the average home cook (me!) thinks that success might be out of reach and this is how I used to think of crepes– but no longer. Crepes are simply a thin pancake; no fancy ingredients needed. The batter is mixed and left to settle overnight (apparently this delay helps prevent the crepes from tearing apart while being prepared and I’d like to try a scientific comparison another time) then briefly cooked in a small pan, flipped, and finished with any number of options: berries, bananas, chocolate, whipped cream, honey, jam, or simply powdered sugar. It is the “flipped” part of those instructions that caused me pause. Flipped. As in tossed up into the air with the goal of landing back in the pan. How might that look in my kitchen? Would there be crepes falling to the floor, evidence of my lack of skill? Probably. Definitely maybe. I pushed those thoughts aside and gave it a go. The first one was a disaster but most first-born pancakes are throw-aways so I didn’t get discouraged. The second was a touch better. 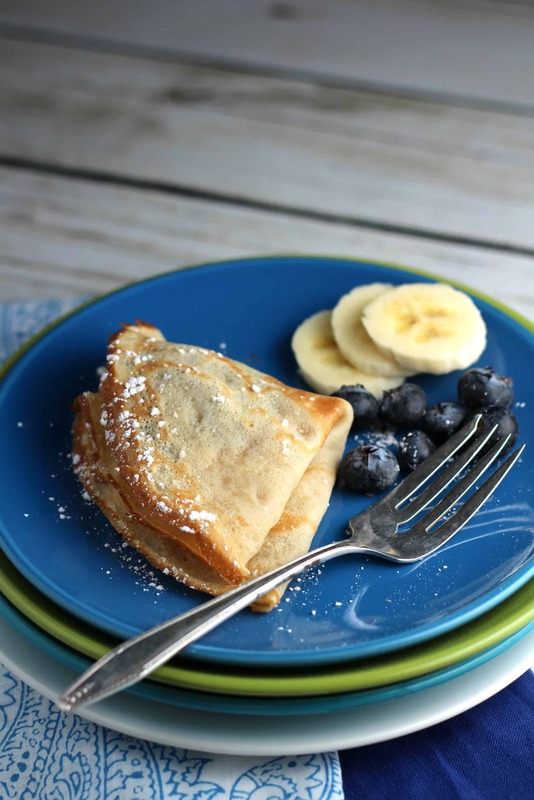 I loosen the edges slightly with a spatula then jiggled the pan to see if the crepe was ready for an airborne adventure; then a quick push forward then pull backwards motion with a flick of the wrist and — wow– there it was– my crepe politely flipped and returned to the pan as if this was nothing new. With each success I grew in confidence and wondered why I hadn’t tried similar recipes years ago. My crepes are filled with Nutella and sliced bananas, blueberries on the side and topped with powdered sugar. What fillings would you recommend to this crepe-flipping newbie? I’m enthusiastic to try this and many of the worldly recipes my friends shared below. I turned to Alton Brown and the Food Network for this basic crepe recipe. Here are the ingredients you’ll need and remember to mix the batter a few hours ahead or even the evening before you plan on making crepes as the batter needs to rest. Please click through for the full instructions. Crepes are simply a thin pancake; no fancy ingredients needed. Mix all of the ingredients (eggs through butter) in a blender. Let the batter sit in the refrigerator for at least an hour or even overnight (recommended). When ready to cook the crepes, heat a non stick skillet over medium heat. Coat the pan with butter then pour one ounce of batter into the pan. Pick up the pan and swirl the batter around to the edges. Cook for about 30 seconds then flip and cook for 10 more seconds. Place filling on half of the crepe. Fold the crepe in half and in half again as shown in the photos. Original recipe found at Food Network. We take turns hosting each month and choosing the theme/ingredient. 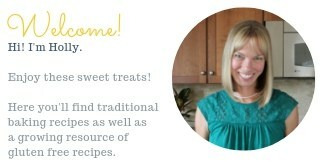 If you are a food blogger and would like to join us, just send Stacy an email with your blog URL to [email protected]. Sincere thanks goes to Mayuri of Mayuri’s Jikoni for hosting this month! Now that you have them down there is no end to the things you can make from sweet to savory. We love crepes in our house. You did the pan flip? How cool is that? These look wonderful Holly! What great crepes! I must admit that I have not mastered the flip though, so good for you! Love this list of pancakes around the world! Can’t wait to try some of these! The crepes look so beautiful! You flipped them over really well I see!! I love crepes on the sweet side but savory are good too! Delicious crepes, these are prefect as a dessert too… with chocolate sauce drizzle.. oh hh yum. That flip is what makes it soooo dreamy to make crepes. LOL. Great looking crepes and well done for your first time. Well, my flip will definitely make the crepes land on the floor. Your crepes looks delicious and with perfect color.